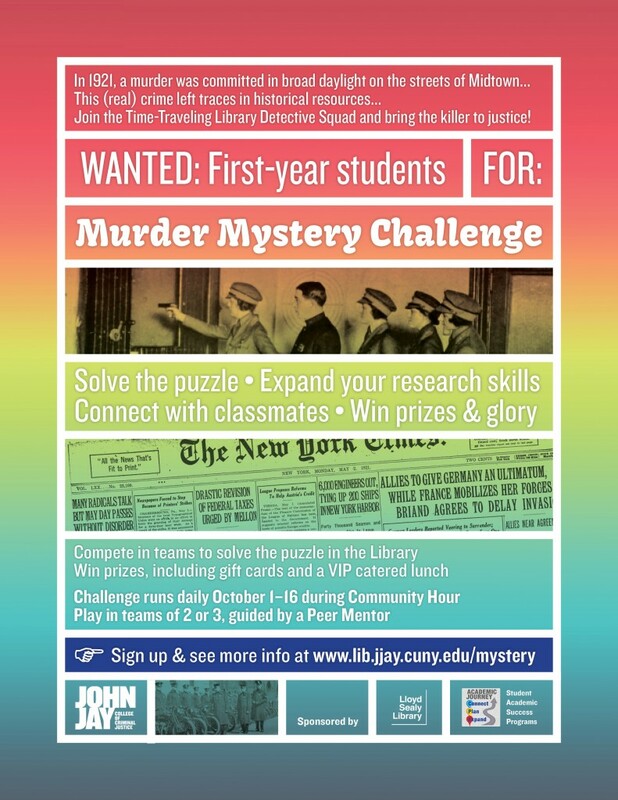 In the fall of 2013, my colleague Marta and I created and organized a Murder Mystery Challenge for first-year students, teaming up with the Peer Mentors in the Student Academic Success Programs here at John Jay. It was so successful that we did it again in fall 2014! 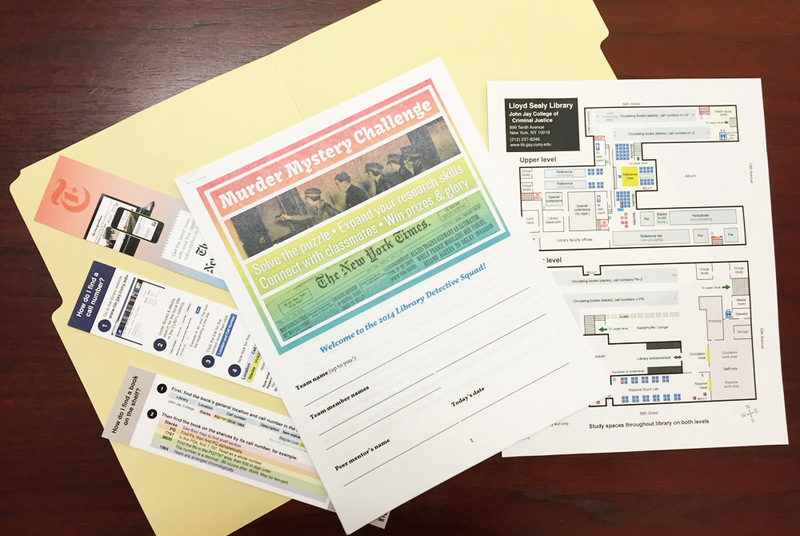 The Murder Mystery Challenge is designed to walk first-year students through basic research tasks. The Challenge follows a murder case narrative based on a real 1921 crime. Students work in teams to use historical resources in the library to solve the mystery. Paper is more fun: Rather than a totally online activity that students met up in-person to complete, we put together file folders with a colorful printed packet, along with some “hint” materials, like a map of the library and our ubiquitous how-to-find-a-book bookmarks. Using a paper packet felt more like completing a scavenger hunt than filling out an online form. And after all, most of their college assignments and syllabi are distributed on paper. Reflecting most library research, many clues did instruct the students to find information online—but encouraged the students to take turns at the computer. I created the nice-looking clues packet in Word, reusing images I’d made featuring photos in our Special Collections. Smaller teams: Teams had 4-5 students last year, but some students felt left out because there wasn’t enough for everyone to do. So this time around, students worked in teams of 2-3, which created a more intimate and intense setting for team learning. Social media: One of the bonus questions instructed students to post photos of themselves with Lil Jay (a bobblehead of our namesake) on 1–5 social media accounts with the hashtags #jjcliljay, #jjcsleuths, and #jjcsasp, and to email screenshots to me. The photos were really wonderful — it’s always so wonderful to see young students having a lot of fun in the Stacks! We collected feedback from a survey sent out afterward. Here are some verbatim student responses. I learned how to enhance my detective skills. How to look for articles in the John Jay library data base. I learned how competitive my friends and I are when competing in a challenge. I learned how to do an APA citation. One of the bonus questions was to cite an article or book, I went to the John Jay library website and clicked the link on how to do citation. What would you change about the activity? I would make the activity a tad bit more difficult and also make it school wide, not just the library. Nothing, It was so fun! Where things are hidden and how much information is given in the clues. Nothing, overall it was a fun and educational experience, although I think having the challenge in the library might have possibly distracted other students at the library by peaking their curiosity as to what we were up to. Are you seeing what I’m seeing? The students wanted more work for this Murder Mystery Challenge!! I did very little reading about games and gamification when designing this, but from the little I’ve read, there’s a “sweet spot” all addicting games hit, when the amount of effort you’re putting forth in a game results in just the right amount of reward. So the sweet spot here seems to be a good balance of time spent on the Challenge, number of clues tracked down, and doing new and different tasks. In Fall 2015, we plan to stage the Murder Mystery Challenge for the third year running. We’re pretty happy with how the Challenge was revised, but we might incorporate using our new discovery service, OneSearch (Primo). 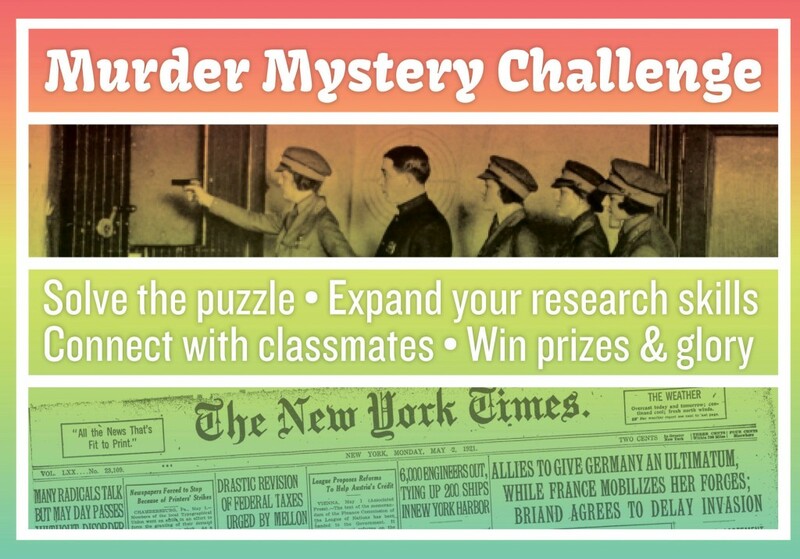 We’re also developing the Murder Mystery Challenge as an online-only activity wrapped up in a Blackboard quiz for online students who need a fun but educational introduction to doing library research online. We’ll have to remove finding a book in the stacks, and add one or two other online activities to make up for it. For this, we’re teaming up with our online learning office and instructional designers, which has been very fruitful for both parties. I must say, this has been one of the most fun things I’ve done as a librarian! It was enjoyable to create a little mystery game using library resources only John Jay has, and it’s so rewarding to partner with other departments at the College — and to see students having a great time learning in the library.